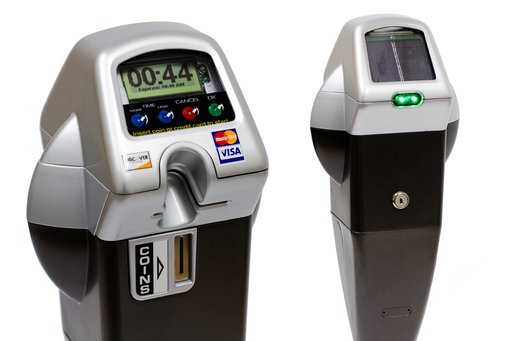 Similar parking meters will be installed in January in San Rafael. Image from IPS Group. Parking is always a sticky problem: there never seems to be enough. The solution, as discovered by San Francisco and described by parking academic Donald Shoup, is demand-responsive pricing, also known as performance parking: charge more for the most in-demand spots and less for ones that are out of the way. With a vote last week, San Rafael will put in place the technology to determine where to do just that in downtown. But with the same vote, the city moves away from a range of prices based on location – the core of performance parking – to a flat rate across downtown. It’s one step forward, one step back. Like any scarce resource, the easiest way to manage it is through pricing. The more valuable a parking space – like one at Courthouse Square – the more the city should charge for it. The less valuable a space, the less the city should charge. People would self-select: if they really want to park on the street at Courthouse Square, they may. If not, they might choose to park in the cheaper spaces or the nearby garage. Most cities today, however, don’t use this approach to parking. They charge a flat rate for all parking spaces, so there’s no self-selection. The result? Insufferable circling for a space, going ‘round and ‘round the block to see if something opens up. It’s like Saturday at the mall: there are plenty of spaces around the lot, but people still circle around, trying to find somewhere closer to the door, often taking longer to park than they would take to just walk from a slightly further-away spot. In addition to being annoying to drivers, all this circling causes traffic congestion. In particularly high-traffic areas, a sizable percentage of congestion is attributable to people circling for a spot. San Francisco took this research to heart and created SFPark, which tries to keep 20 percent of parking spaces free on each block within a number of pilot areas. The city embedded sensors to detect whether a space is occupied. Staff take that data to adjust the price of parking incrementally up or down each month. The result has been a decline in traffic congestion, parking tickets, and even the average price to park, as price reductions have been more common than price hikes. In San Rafael, the city’s parking program is facing a budgetary shortfall. The program runs on the parking charges, but those weren’t enough to cover the various renovations needed as well as operations. The city, in response, decided to pass a moderate reform of how it does parking in downtown. On the technology side, the city will purchase about 1,000 new parking meters with credit-card readers and parking space sensors. The sensors will tell the meters when the space is vacated so it can reset, tell parking staff when someone has run out of time, and tell drivers where parking is available via a phone app. The sensors could also be used by parking staff to do a running survey of how people use the city’s spaces, but, at this point, there’s no sign they will. And, rather than implement a performance parking program, the city has raised the rate on all on-street parking spaces to $1.50 per hour, up from $1.00 on Fourth Street and $0.75 on side streets. It was on this hike Kate Colin raised concerns, and why she was the lone dissenting vote. The former planning commissioner wondered why side street parking should double in price. Those areas aren’t in demand now, and raising their price relative to Fourth could put more pressure on Fourth Street’s spaces. One reason for such a dramatic hike, however, was to encourage people to use the garages and parking lots, whose prices won’t be changed. Lots will remain at $0.75 per hour, and garages at $1.00 per hour. While a good idea, it does make one wonder how much spare capacity the garages and parking lots have that they can absorb much of the on-street demand. Despite the rate hike, the technology is the real win. It’s a $750,000 investment – about $750 per meter – that will last for a very long time. It would have been difficult to get the sensors and meters under a performance parking program. The parking charge, while misguided, is on paper. If the city wants to start a performance parking program now, it would be extremely cheap, without any extra capital investment. It would simply be a matter of legislation and organization, not money. This would be a good project for the Downtown BID and Kate Colin to spearhead, perhaps with TAM PDA funding. A concern for those interested in performance parking is that revenue seems to be an overriding concern for the Parking Services. It has outstanding capital costs now, along with two parking structures that are apparently at the end of their lifespan. Performance parking can actually mean less revenue for the city than the traditional flat-rate charge, which runs counter to revenue needs. If some of these capital projects are found to be unnecessary, or if another revenue stream can be found, then that would take some pressure off. For the city planning department, the sensors could mean a real-time survey of parking conditions around the city, a fabulous tool. It would let planners know how new office tenants or apartments change parking demand. It would let them know whether there was spare capacity in the parking system to shape changes to parking policy, such as eliminating parking minimums or residential use of downtown the garages. Someone has to make the data available to other city departments, however, for this to happen. The changes to parking in San Rafael are promising, and it’s encouraging to see Councilmember Colin taking a stand for the essence of performance parking: varying the price based on location. A native Marinite working in Washington, DC, I am fascinated by how one might apply smart-growth and urbanist thinking to the low-density towns of my home. Thanks David, Another GREAT article, and good for Kate Colin for recognizing the opportunities with the new data tools. David, Thanks for covering these issues. My understanding of SFPark is that meter rates are evaluated and, if needed, adjusted less often than monthly (I think it’s more like every six months). From the data on that page, it looks like rates are converging, although there could be some surprises in the data, like blocks flipping back and forth. The spreadsheet on the last update actually contains the full history of the program, but I haven’t dug in further. I’m fascinated by the SF parking program. Its interesting, though, that even in a place like SF that has gone “all in” on demand-responsive parking, there are still certain restrictions. These include: a minimum price, a maximum price, a limit on how much prices can move, and adjustments that happen only fairly slowly. In SF, prices are moving toward an equilibrium where they are changing less and less over time. However, if SF had been a little more open to a wider range of prices that change quicker, the benefit would have been greater and the equilibrium might have been reached in a few months, rather than what will end up being a few years. All of this is a nod to the fact that, even though the economic theory of market pricing is rock-solid, politicians often respond to citizens who complain about variable rates being unfair or confusing. I think this fact is under-appreciated in academic and urbanist circles. SF may have been able to mostly withstand these types of complaints, but other jurisdictions may have a harder time. Thus, the unwillingness by some cities (like San Rafael) to embrace demand-responsive parking might have less to do with elected officials not understanding the concept and more to do with their public not being willing or able to. I think that there is something similar that happens with parking lots tied to public transit services. Cities or transit agencies can be persuaded to charge for parking (see GGT at Larkspur). However, its much tougher to get them to charge a dynamic, market-based price. The reluctance is often based on the idea that it will be too confusing to the public or somehow unfair if different lots have different rates. The result is that transit station charges are sometimes justified on the grounds of being an intrinsic moral good, rather than a tool to manage demand and optimize revenue and ridership. It will be interesting to see if Golden Gate Transit sticks with a flat $2 charge at the Larkspur Ferry for many years, or if it will be willing to adjust prices with some regularity based on conditions. If I had to bet, I’d say the former. For three years, The Greater Marin has been the county's premier blog about transportation and development policy. Now, you can give back to the reporting and opinion you value. Become a patron and donate today. What do driverless cars mean for suburban planning? What's the deal with San Rafael's one-way streets?